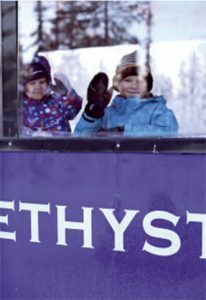 Amethyst Mine is located close to holiday resorts of Luosto and Pyhä. Nature around Lampivaara Amethyst Mine is great all year round, as we are inside one of our large National Park, Pyhä-Luosto. Due to reason that we are located in National Park, please notice that private motoring is not allowed. Local taxis and charter coaches may drive along service road. In winter time this is not possible as there is no open road during winter time. If you are coming from Rovaniemi, then the easiest option is to come by skibus or rent a car. Timetable for skibus you can find from here. The best option is to depart 8:50 from Rovaniemi and arrive to Luosto around 10:50. The nearest skibus stop near Amethyst Shop at Luosto is Lapland Hotel Luostotunturi. The Amethyst Shop is across the hotel and from the shop you can buy tickets to the tours. Or if you feel like walking a little bit, then you can ask the skibus driver to leave you at Ukkoluostontie crossing and walk 1 kilometre along the road to Ukkoluosto parking lot. 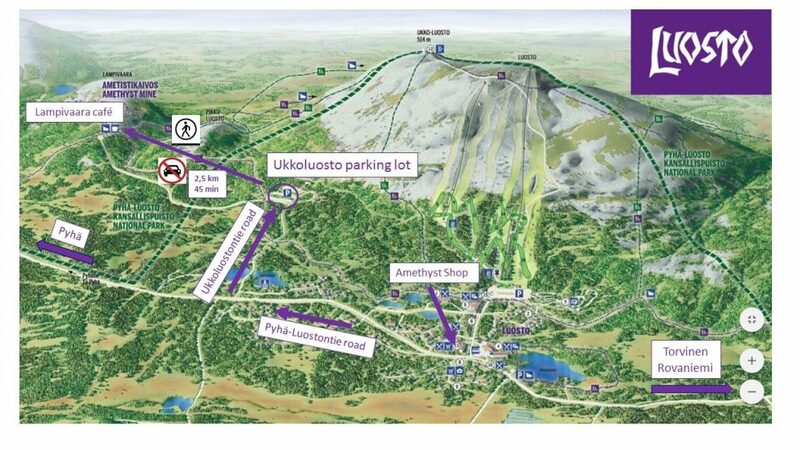 During summer you need to continue walking from the Ukkoluosto parking lot to Lampivaara café (2,5 km) or during winter you can hop in the amethyst pendolino at 11:30 or 14:30 and it will take you to the Amethyst Mine. Or then you can ask the skibus driver to leave you at Rykimäkero parking lot (only during summer) and then walk 3 kilometres to Lampivaara café and after the tour you can walk to Ukkoluosto parking lot (2,5 km) and to the crossing of Pyhä-Luostontie (1 km) and wait for the skibus to pick you up. If you plan to walk, please notice the skibus timetable and be in contact with the skibus driver.